Daily Mirror - PM to form UNP Govt. 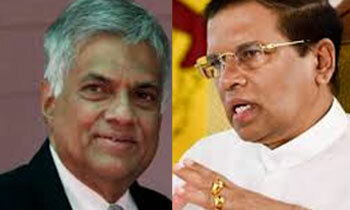 PM to form UNP Govt. Prime Minister Ranil Wickremesinghe obtained the consent of President Maithripala Sirisena to form a UNP government in place of the current unity government between the United National Party (UNP) and the Sri Lanka Freedom Party (SLFP), a source close to the UNP said today. The Prime Minister met the President in the wake of the February 10 local council elections which saw the defeat of both the UNP and the SLFP. Sources close to the Prime Minister told Daily Mirror that the President had informed Prime Minister Wickremesinghe to form a government if he could muster a majority in the House. The President had also informed the Prime Minister that he would request the MPs who want to remain in the SLFP to join the UNP if it could muster a majority. Sources said the UNP would reveal the details of its majority by Thursday, February 15. It was also reported that the other parties in the United National Front (UNF) had also agreed to form a UNP-led government. Excellent! This Local Government Election has provided us with clear evidence as to the traitors who enjoy the perks of being in the Government whilst working against it.They are traitors to the Nation! Ranil MUST resign. There is no way forward under him. But of course the dolt can't see that. Finally good move, lets show the strength ! Ranil, Your time has come to step down and give the leadership to an efficient , honest and a young UNP'er. Please do not ruin the party anymore. If this news is true. it confirms again that Sirisena left SLFP and unofficially joined UNP in 2015. What ever it is, the expiry date of this government is a few months away. Mr. PM, Please, pack your bag and baggage only to head home in a decent manner. Public spoke out clearly rejecting your unity government. It's a good idea Ranil but with a nother man as head.I suggest MrPremadasa who has a grassroot upbringing. otherwise general election results will be the same as the local one. you can be the head, Ranil if you are capable of making drastic changes as promised at the General elections, which the people of the country thought would happen.